It was on this day in 1928 that “Steamboat Willie ” was released and starred our favorite cartoon mouse. This seven minute Walt Disney masterpiece was the first cartoon with a synchronized soundtrack; making it a pioneer in the movie industry. Although “Steamboat Willie” was not Mickey’s first short film appearance, it is considered to be his film debut since the other shorts were not widely distributed. 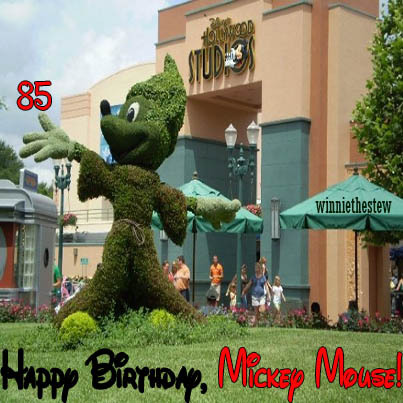 I want to wish Mickey a very Happy 85th Birthday! Hoping that Minnie and the rest of the Disney crew have something fun planned for him today! This entry was posted in Magic Kingdom, Walt Disney World and tagged Animation, Cartoon, Mickey, Mickey Mouse, Short film, Steamboat Willie, Walt Disney, Walt Disney Company. Bookmark the permalink.